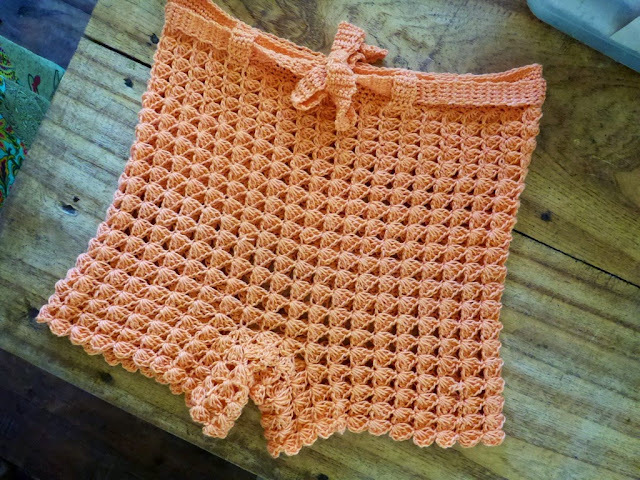 I got a stitch pattern and using 3mm hook and 4-ply cotton yarn, I want to make a pair of house shorts. 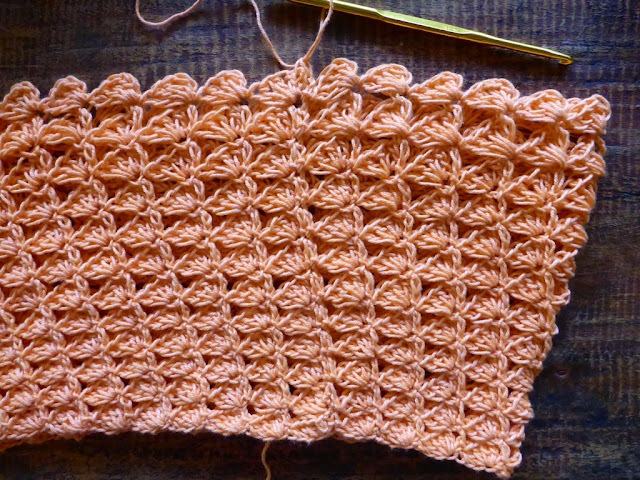 The stitch pattern (shown below) is worked in rows, multiples of 4 sts+4. I am working in the round so that needs 4 sts foundation chain. 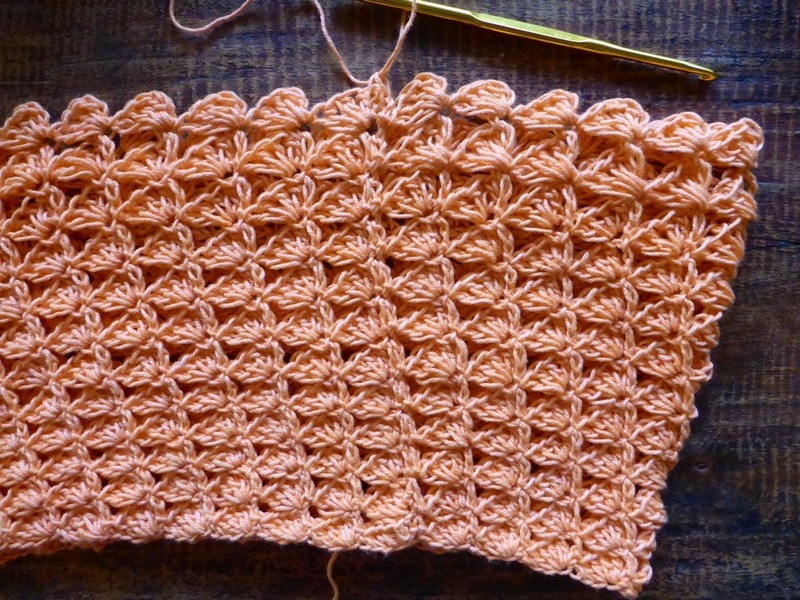 (Note: stitch pattern is in UK crochet terms). 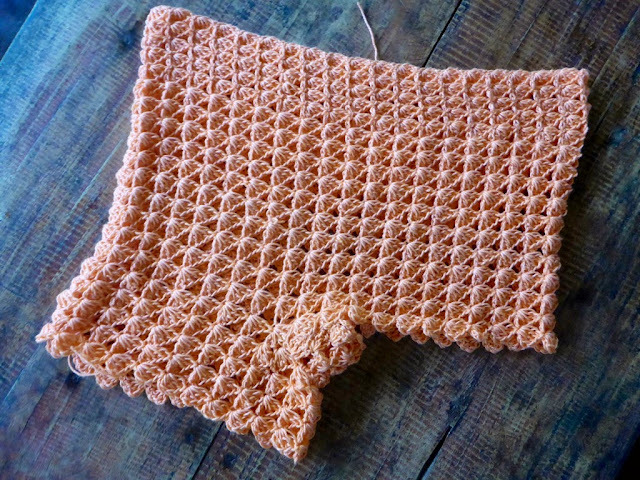 Here’s the stitch pattern (UK crochet terminology used) for the shorts. Can you modify this to work it in rounds? 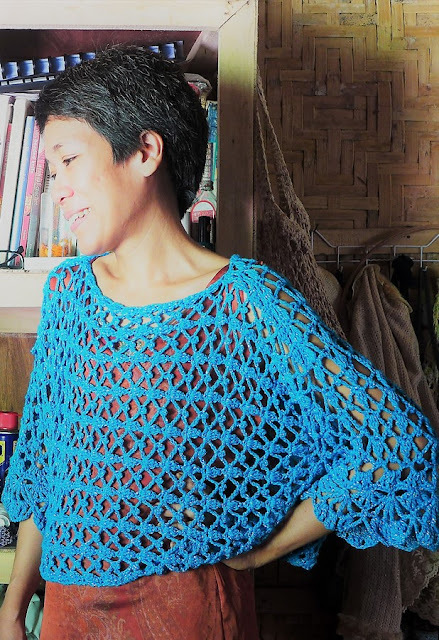 A quick project – I completed this in less than two days – it’s a good exercise in simple shaping the modifying a stitch pattern. One essential thing in crocheting garments that I have never done is making a gauge swatch. 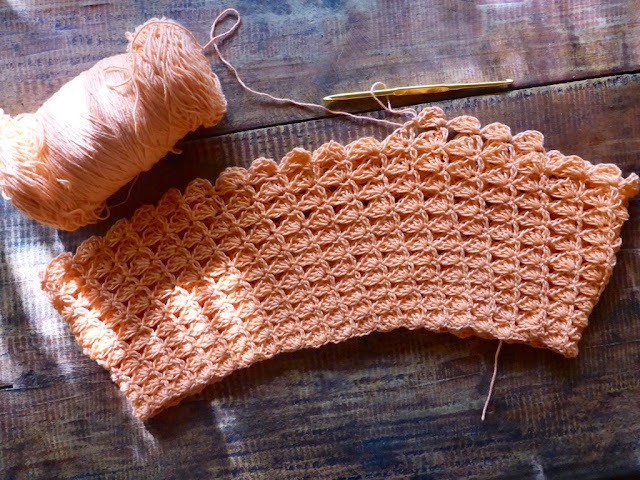 A gauge swatch helps the crocheter keep to the sizing of a given pattern. For the designer, the gauge swatch helps determine how the garment may be worked for different sizes. For this latter purpose, I may soon be making the gauge swatch, but for most other circumstances, I’ve never used it. 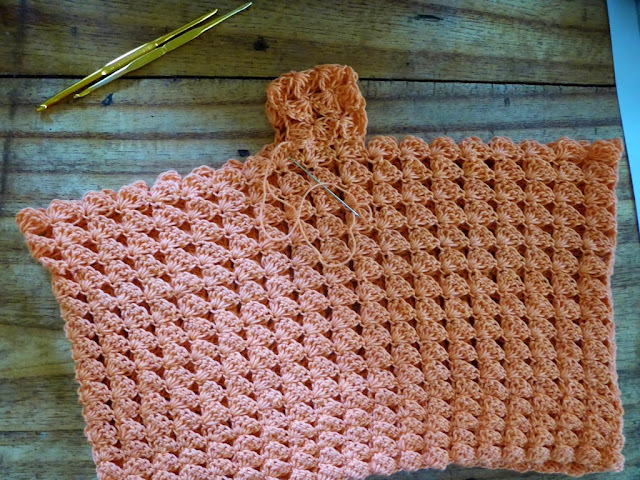 Instead, I familiarise with the yarn and hook, look at the stitch pattern and make estimates from there. For example, this pair of shorts, I want it to be loose-fitting. 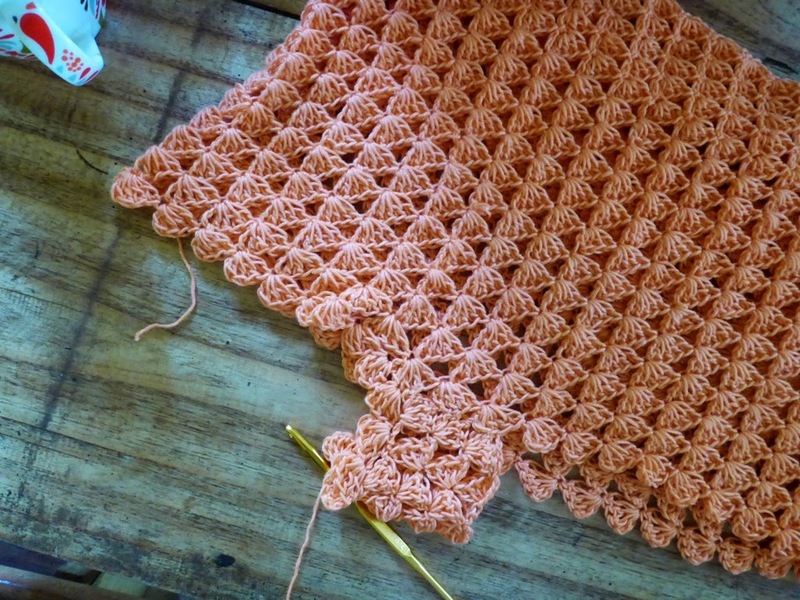 Looking at the stitch pattern I can see that the foundation chain needs to be longer by 2-3 inches because the stitch pattern skips 3 chains. 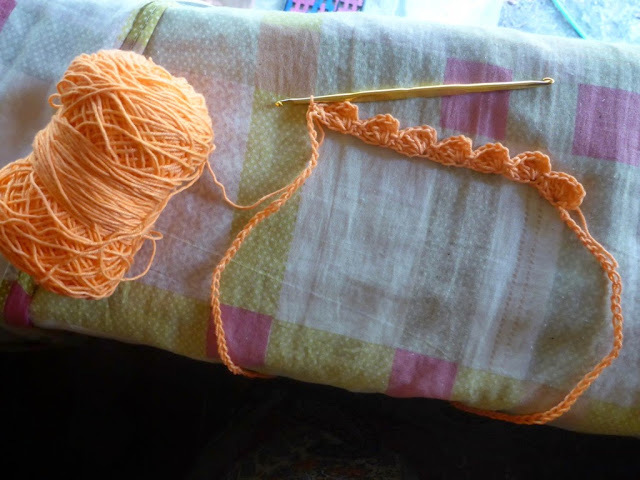 The dc stitches normally are 2-ch long especially if stacked together. So this means the chain will become shorter once the stitch pattern’s first and second rounds are completed. So I made a chain in multiples of 4 that is 2 inches longer than the largest measurement of my hips. 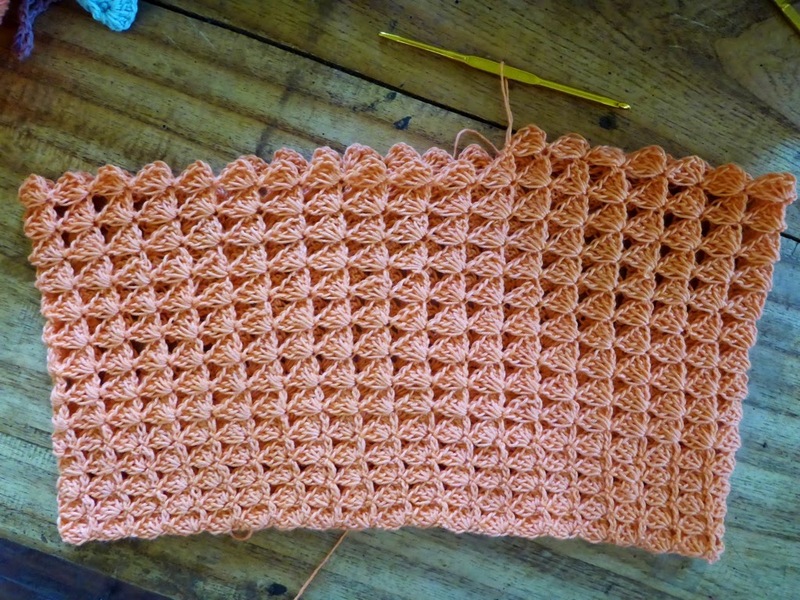 Then I worked a full round of the stitch pattern and put it on to see if it fits. It fits. Then I made 3 more rounds. It still fits with just enough space. I made a foundation chain that’s about + 2 inches my hip measurement. 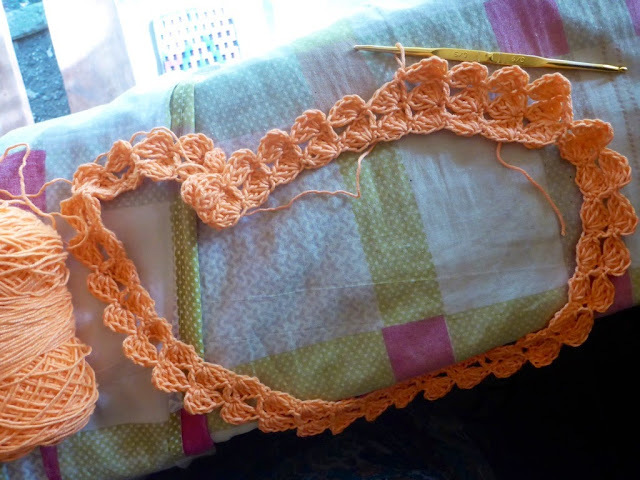 I work about 3 repeats of the stitch pattern and check if it still fits around my hips. This is how I work, just looking at the stitch pattern, the hook and yarn. 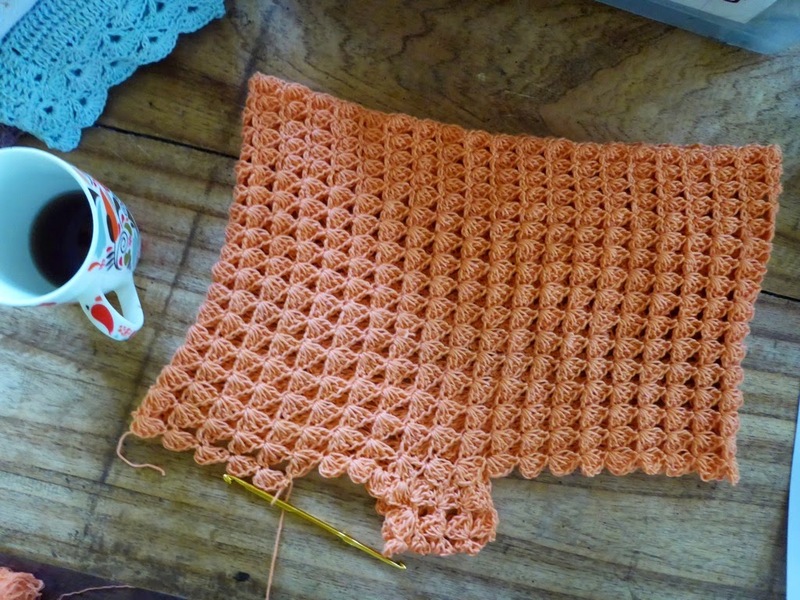 As I work towards the lower hip, I will probably use a larger hook to increase shape, if not, modify the pattern to increase the number of stitches. I start with 3mm hook then after 4 rounds switch to 3.5mm, then to 4mm and 4.5 mm. The shorts flare out towards the hip as I use larger hooks to increase the size. Here, shorts continue to flare out to where I split for the leg openings. NOTE: I made an error making the stitch pattern, it can be a bit confusing so pay attention! Now making the crotch, the stitch pattern is worked in rows. Crotch should be at least 2 inches wide and 2 inches long. I join the crotch to the other side of the shorts using a large needle. 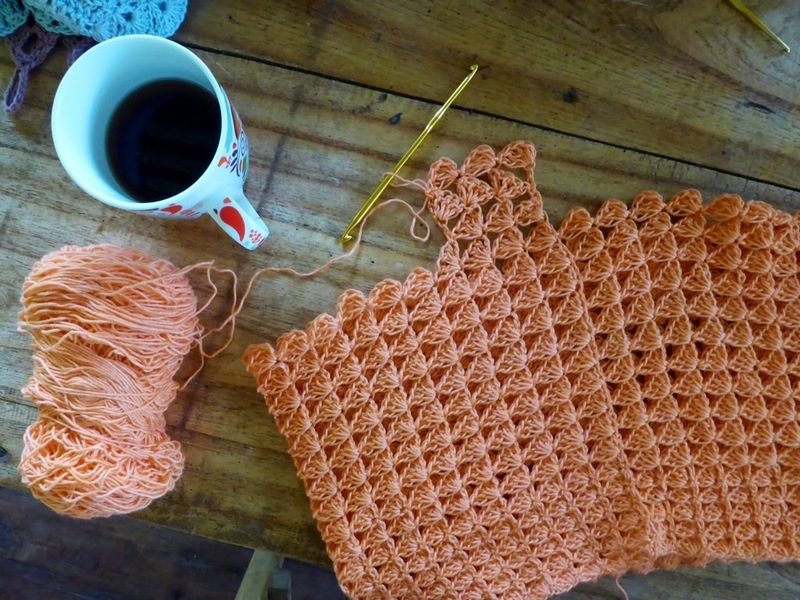 Make sure that you have the same number of stitches for each leg opening when you join the crotch. I join the yarn to one side of the shorts and work in the round for the leg. One leg finished! The next challenge is making sure you have the same number of stitches for the other leg! Finished shorts! The waistband is simple sc stitches. Then I made a long belt, also all of sc stitches. Then I sewed the belt loops – five loops – along the waistband. The finished shorts – fits just right! For looser shorts, you’ll need to start with a much longer foundation chain.